The abbreviations list defines “1-to-4 inc” as “(k1, p1, k1, p1) in next st” and “1-to-5 inc” as “(k1, yo, k1, yo, k1) in next st.” But you can certainly work these increases some other way, if that’s your preference. Got a strong preference, for a pattern you’re adding to the collection? Make a note in the pattern’s Description. 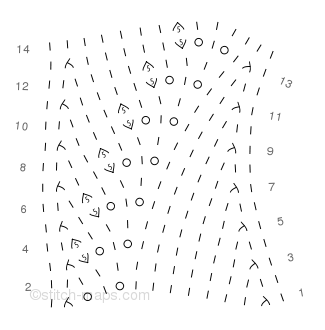 By the way, these new stitches came with some changes to the way Stitch-Maps.com draws its stitch maps. For the most part, I’m hoping these changes prove to be for the better. But if you notice any funkiness in the stitch maps that the site draws, please let me know!